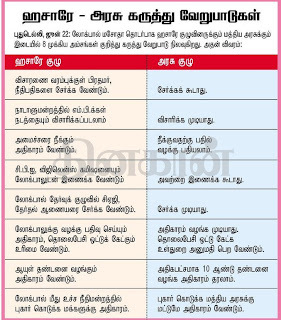 PTI A graphic presentation showing the differences between Team Anna and the government over the draft Lokpal Bill. The Joint Drafting Committee on the Lokpal Bill ended its deliberations on Tuesday without a common text, and the government has decided to go ahead with its plan of consulting political parties and Chief Ministers on the two different versions before getting the Cabinet to clear a final draft. Expressing "deep disappointment" at what it said was the government's watered down version of a Lokpal Bill — an official draft was presented to it for the first time on Tuesday — Team Anna criticised the exclusion of the Prime Minister from the ambit of the ombudsman and threatened to take to the streets from August 16. Anna Hazare, who has accused the government of lacking the will power to draft a Bill altogether, plans to go on another "indefinite" fast from that day. "The people will teach them [the government] a lesson," Mr. Hazare said. The ninth and last meeting of the committee did not last an hour; the two sides exchanged their drafts. The government representatives were, to quote Union Law Minister Veerappa Moily, "quite happy that the deliberations of the committee have come to an end." Mr. Moily, accompanied by Kapil Sibal and Salman Khursheed, said both versions of the draft Bill would be circulated among the Chief Ministers and political parties ahead of the all-party meeting in July and, along with their responses and comments, the Cabinet would be approached to take a decision on the final draft to be presented before Parliament. The Ministers said the decision to keep the Prime Minister out of the purview of their draft was not that of the government but of the five Ministers on the committee. The Prime Minister had no role in it, they stressed. They clarified that they had discharged the responsibility vested in them to take a call on the issue and decided to keep the Prime Minister out of the ambit of the Lokpal for various reasons, which, among others, was not to question the integrity of the post. Only the Cabinet took government decisions, they explained. They said the attempt was to set up a new institution; the parameters of the new system had to be drawn at a particular point without changing the law of the land. The power to subject the Prime Minister to scrutiny had not being given to the Lokpal but he would still continue to be covered under the Prevention of Corruption Act and the CBI. Stressing their draft Bill was the outcome of deliberations with the civil society members spread over nine meetings, the Ministers said it was the best possible Bill in the current geo-political situation. Agreement was over 34 out of the 40 points presented by the civil society members. They explained in great length the difficulties in adopting the six other suggestions made by Team Anna even to give all powers to the Lokpal to investigate and prosecute bureaucrats who enjoy protection under the Constitution. 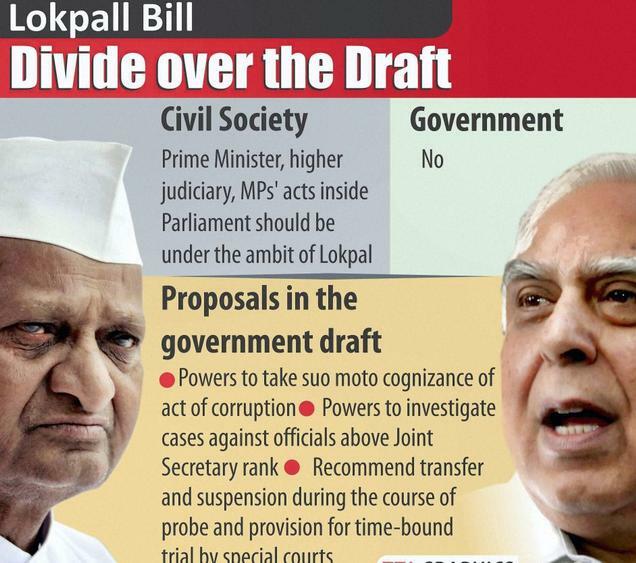 The only one contentious issue came up for discussion at Monday's meeting between the government representatives and the civil society members of the Joint Drafting Committee on Lokpal Bill. It was the selection and removal of Lokpal members. The two sides differed on both counts. The government preferred a committee comprising the Prime Minister, the Lok Sabha Speaker, the leaders of both the Houses, the Leaders of the Opposition of both the Houses, the Home Minister, a judge of the Supreme Court, the Chief Justice of a High Court and the Cabinet Secretary. The civil society members opposed this, saying it was packed with politicians; instead, they suggested a committee of the Prime Minister, the Leader of Opposition, two Supreme Court judges, two High Court Chief Justices, the Comptroller and Auditor-General (CAG) and the Election Commissioner. As for the removal, the government sought to reserve for itself the right to approach the Supreme Court with the complaint, while the civil society members proposed that any citizen be free to send a complaint to the Chief Justice. Mr. Bhushan said the aim of the civil society members was to ensure independence and fairness in the selection and removal of Lokpal members. "The issue is whether we will have a comprehensive Lokpal or just one looking [into] a few high profile cases." He hoped that the government would involve the whole country in the drafting of the Bill and listen to the general public and not just the political parties. Meanwhile, the deliberations of the sixth meeting of the committee, which the civil society members boycotted after the police action on the Ramlila Grounds, has been made public. At the meeting, the government members discussed whether Lokpal members should be barred from contesting elections and whether the office of Prime Minister should be brought under the purview of the Lokpal. The five Ministers failed to reach consensus on whether Lokpal members should be barred from contesting elections as it was suggested that a person's eligibility was laid out in the Constitution and any attempt to bar would need a constitutional amendment. One Minister even opposed the idea to bar the members from contesting elections. They decided to leave the issue to the Cabinet for a final decision. Similarly, on the issue of inclusion of the office of Prime Minister under the ambit of the Lokpal, Union Finance Minister Pranab Mukherjee took the stand that any inquiry should be suspended till the Prime Minister held the office and, once he demitted office, an inquiry could be initiated. As regards former Ministers, Union Home Minister P. Chidambaram held that all those covered by the Prevention of Corruption Act should be brought under the ambit of the Lokpal even after retirement. The meeting favoured inclusion of Ministers, former Ministers, MPs and former MPs under the ambit of the Lokpal. 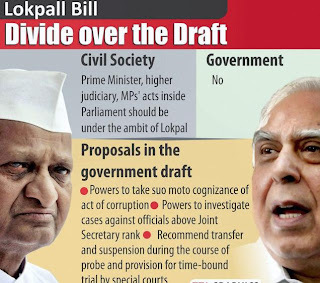 NEW DELHI: The protracted tug-of-war over the Lokpal bill appeared to have come to the end of its first phase as the joint drafting panel held its final meeting on Tuesday, producing two separate drafts of the bill, signalling the unbridgeable gulf between the views of the government side and the civil society representatives. The two versions will now go for the consideration of a soon-to-be convened all-party meeting. After political consultations, the draft bill will be considered by the Cabinet and subsequently will go to the Parliament. It is unclear at this stage how the two drafts will be reconciled or the differences eliminated, and at what stage. The civil society members have already expressed their unwillingness to relent. Social activist Anna Hazare , who spearheaded the agitation for a strong anti-graft legislation, announced last week that he was unhappy with the progress made through negotiations, and would resume his fast-unto-death on August 16. Addressing the media after the last meeting of the draft panel, Union HRD minister Kapil Sibal indicated that the draft bills might be subject to a much wider consultation process, including all political parties as well as state governments, than previously thought. Sibal said the government was happy with the progress made, even though some differences remained. The key differences that remained were over the inclusion of the prime minister under the Lokpal's ambit (government is opposed to this), the inclusion of higher judiciary (the government feels this would duplicate the purpose of the judicial commission ) and inclusion of lower bureaucracy (government favours the inclusion of officers of grade A and above). The other key differences include the conduct of MPs in Parliament and the terms of the selection and removal of Lokpal members. Speaking to reporters after the meeting, water resources minister Salman Khurshid said the government was not in favour of amending the CrPC, which would have been required to incorporate some of the suggestions in the civil society's draft bill. Sibal said the civil society members were in favour of making death penalty the maximum punishment for graft under the bill, but they settled for life imprisonment. "You can't have a parallel government outside the government to run this country," Sibal said. "We want a strong Lokpal bill, but we don't want to compromise the very delicate constitutional balance provided for in the Constitution by our forefathers. They were far wiser than us," Sibal said. The government and Team Anna Hazare exercise to work out an agreed draft for a Lok Pal Bill ended in failure tonight after their ninth round of talks. The two sides issued their separate drafts, with the government saying it would combine what was possible and issue a single set of proposals, to be taken to the all-party meeting on July 7. The Bill is then expected to go to the Cabinet before being introduced in Parliament most probably in the monsoon session. As for Anna Hazare, whose earlier fast-unto-death led to the compromise of a joint drafting panel, which ended on Tuesday, he said he was left with no option but to proceed with his plan of another indefinite fast from August 16 "to teach the government a lesson". While the government side said the discussions had helped in preparing a "strong and robust" bill, the Hazare camp expressed "deep disappointment" with the former's draft. "The government has no intention to bring a strong Lok Pal bill. It is misleading the people. 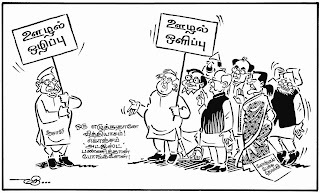 Now, there is no option but to go on fast from August 16 as announced earlier," Hazare told reporters after the meeting. As for the government, it was swift off the mark in shoring its political front. Prime Minister Manmohan Singh convened a meeting of all members of his United Progressive Alliance coalition in the evening, and all of them expressed support for the government line and draft. That included the sullen DMK, whose leader in the Lok Sabha, T R Baalu, came in person to express support. "We agreed to disagree," Union HRD minister Kapil Sibal said on Tuesday at the conclusion of the last meeting of the joint committee on Tuesday. 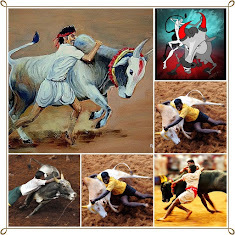 The main differences remained on selection of a Lok Pal, its powers and jurisdiction. While the draft released by the Hazare team is for inclusion of Prime Minister and judiciary under the Lok Pal's ambit, the government draft is not. The two drafts also differ on bringing the Central Bureau of Investigation and the Central Vigilance Commission under the Lok Pal as demanded by civil society members. The civil society draft also calls for powers to the Lok Pal to probe the conduct of MPs inside Parliament, which the Government is opposed to. The two are also at variance on the structure of the Lok Pal, and the procedure for selection and removal. The government wants a 11-member Lok Pal only and the other group wants district vigilance officers, too. The government wants a predominantly political panel to select Lok Pal. Its suggested selection panel has the Prime Minister, opposition leader, Speaker of the Lok Sabha, home minister, opposition leaders from the states, the cabinet secretary and one judge each from the Supreme Court (SC) and high courts (HCs). The Hazare draft asks for the Comptroller and Auditor-General, the Chief Election Commissioner, two judges each from the SC and HCs and all retired Lok Pals to also be on the selection panel. 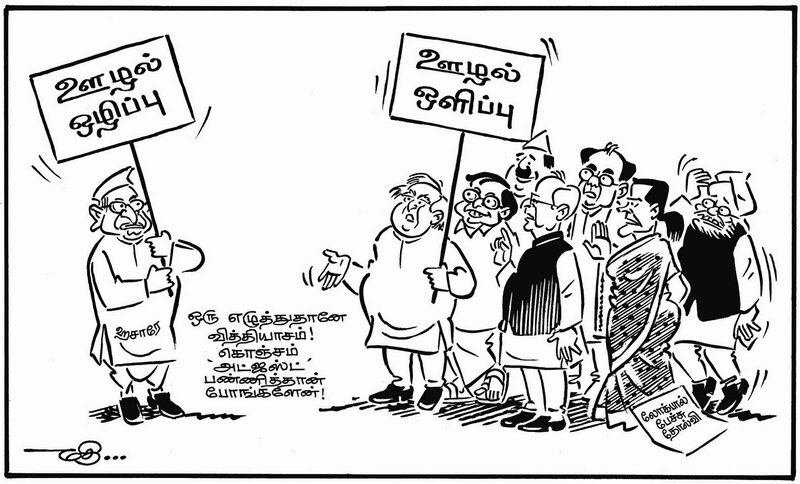 The only political figures are the Prime Minister and opposition leader. The removal process suggested by the civil society draft says the SC can order an inquiry and order removal on a complaint made by any citizen. The removal is not within the hands of the common man in the government draft. The government draft proposes several critical powers conferring quasi-judicial status to the Lok Pal, besides powers to attach assets, an independent prosecution and investigation machinery, with full police powers. The various proposals in the government draft include powers to take suo motu cognisance of acts of corruption, powers to investigate cases against officials above joint secretary rank, recommend transfer and suspension during the course of probe and provision for time-bound trial by special courts. The government draft does away with the rule for securing sanction for prosecuting a public servant. The government draft provides for jurisdiction over Union ministers other than the Prime Minister and MPs. 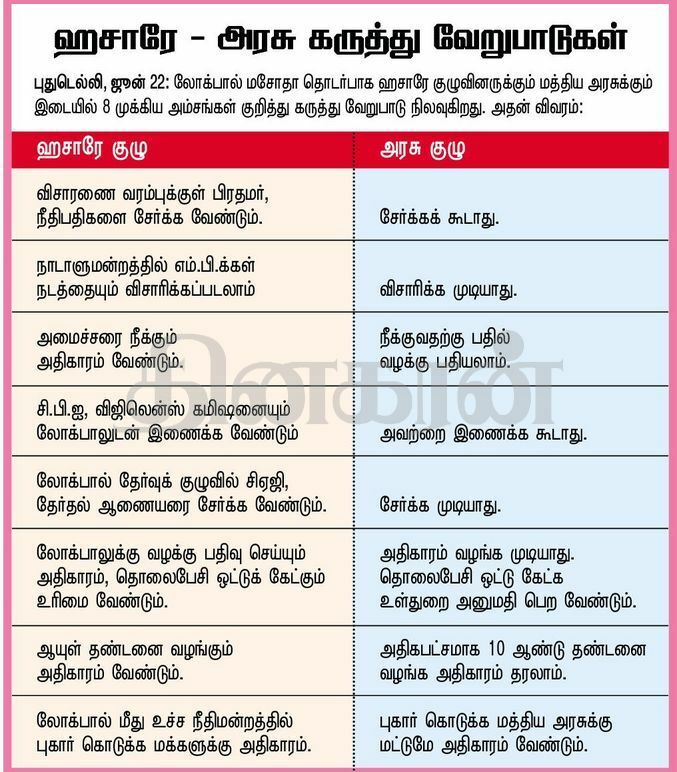 It specifically bars any enquiry into matters relating to any allegation of corruption against MPs in respect of anything said or vote given by them in Parliament. The ministers said jurisdiction over MPs' conduct inside Parliament would be a violation of the immunity provided to them in the Constitution. "The Prime Minister is still covered under the Prevention of Corruption Act and he does not enjoy any immunity. The CBI can still probe him. Only, we are not giving this power to the Lok Pal," said HRD minister Kapil Sibal. Water resources minister Salman Khurshid said the government side decided to draw the line at a particular point and excluded the Prime Minister as he is the "lynchpin" of Parliamentary system. NEW DELHI: Powers to tap phones, issuance of letters rogatory and recommendations for changes in work practices to reduce scope for corruption are among the proposals made by the Anna Hazare team in their Jan Lokpal Bill which do not find a mention in the government draft. The draft submitted to the joint committee on Lokpal bill by the Hazare team also seeks power to the proposed ombudsman to acquire modern equipment necessary for proper investigation and inquire into the assets declaration statements filed by all MPs. According to the Jan Lokpal Bill, an approporiate bench of Lokpal shall be deemed to be "designated authority under Section V of the Indian Telegraph Act empowered to approve interception and monitoring of messages of data or voice transmitted through telephones, Internet or any other medium..."
In the powers and functions of the Lokpal and its officers section of the civil society's draft, the ombudsman can authorise a bench of the Lokpal to issue letters rogatory in relation to any case pending investigation. This provision is in contrast to the stand taken by the Hazare team in the fourth meeting of the joint drafting committee held on May 23 when lawyer Shanti Bhushan clarified that the intent was to allow Lokpal to directly approach the court for letters rogatory and not to route such requests through the government. Bhushan's comment came after Home Minister P Chidambaram pointed out that the powers of issuance of letters rogatory was within the domain of the courts. A letter rogatory is a formal request from a court to a foreign court for some type of judicial assistance.